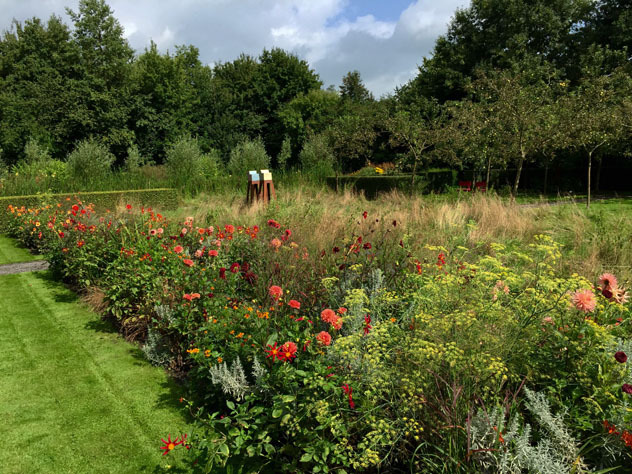 I was invited by my Dutch friend Heleen Heyning along with my friend and business partner, Jane Couch to visit Holland in late August with the plan to immerse ourselves in Dutch Gardens. 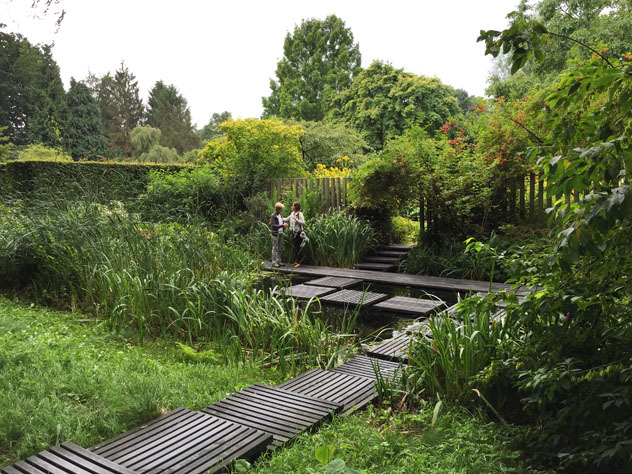 At the top of our list were the gardens of one the 20th Century’s greatest landscape architects Mien Ruys. Mein Ruys died in 1999, but her gardens created over seventy years and encompassing thirty garden rooms on 6.18 acres lives on. 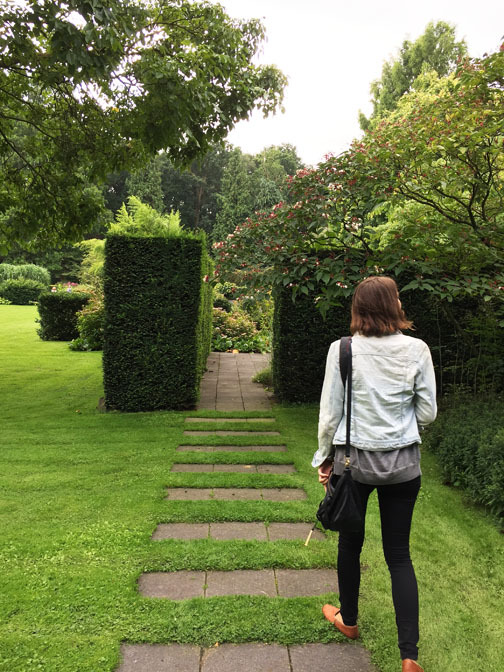 I had seen many photos of her gardens prior to my trip, but nothing could prepare me for the magical experience of walking through the timeline of her ideas and experimentation of her innovative garden spaces on my two feet. 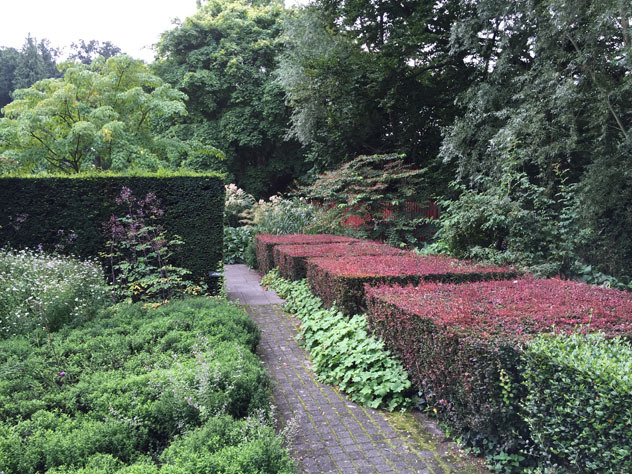 Use of hedges create strong lines in the garden composition. 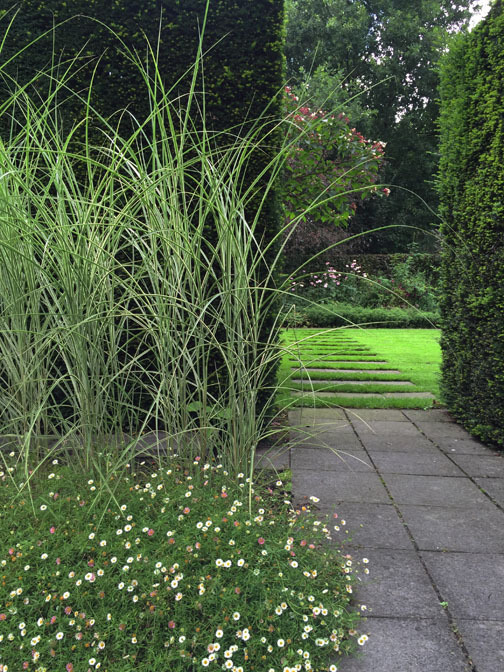 Ruys was known for her use of long diagonal lines in the form of garden paths to create the illusion of a larger garden. This device earned her the name of ‘Diagonal Mien.’ I was surprised to see amongst the many garden rooms, one that while on the ground focused on the issues that roof top gardens design has to encompass and all this way before roof top terraces became fashionable. Although the designs look somewhat dated now, she was ahead of her time working out lighter soils for weight issues, shallow planter boxes and plants that required less soil. 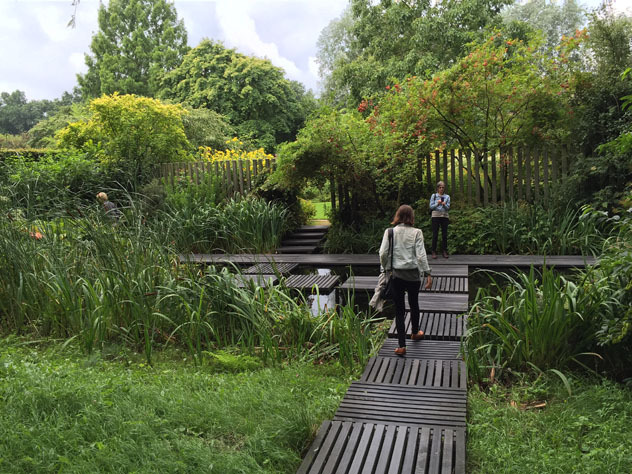 The different garden rooms demonstrated her exploration of new design approaches, modern materials, and new plant combinations. 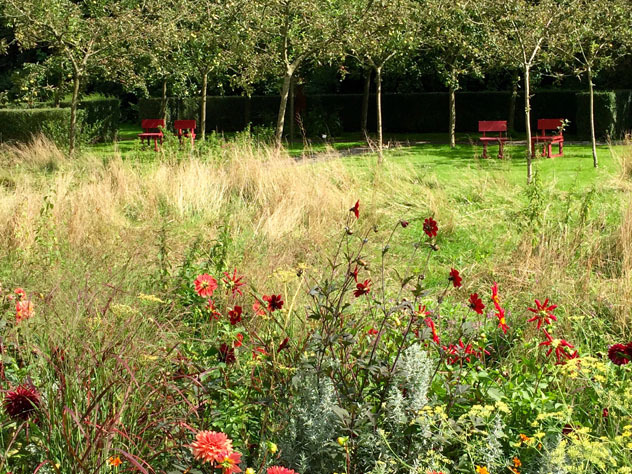 Her gardens represent seventy years worth of ideas – truly mind blowing stuff. 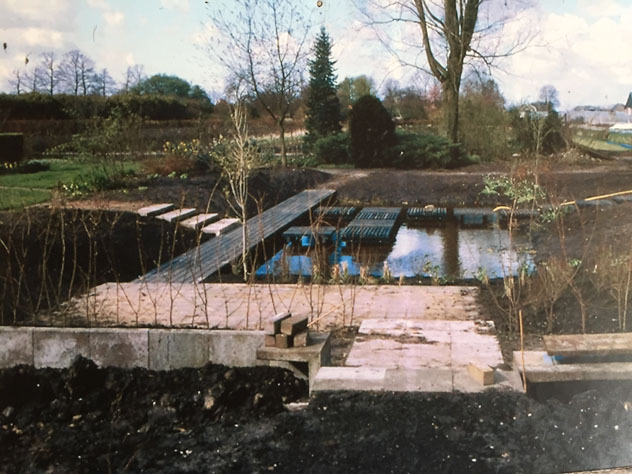 Ruys was fortunate to grow up on her father’s Bonnes Ruys’s nursery called Moerhein which translates to ’the house on the peat.’ Bonnes’s first grew crops and shrubs that led over time to the development of a very well known perennial nursery. 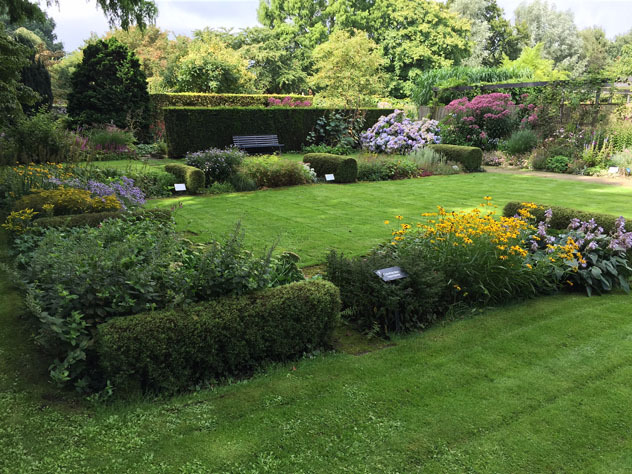 One of his clients was the English gardener Gertrude Jekyll, who Mien met, and attributed her love of color in the garden to Jekyll’s influence. Mien was exposed to Arts and Crafts gardens known for their highly formalized design of laying out gardens in rooms. Arts and Crafts garden rooms are usually entirely enclosed by walls or hedges. 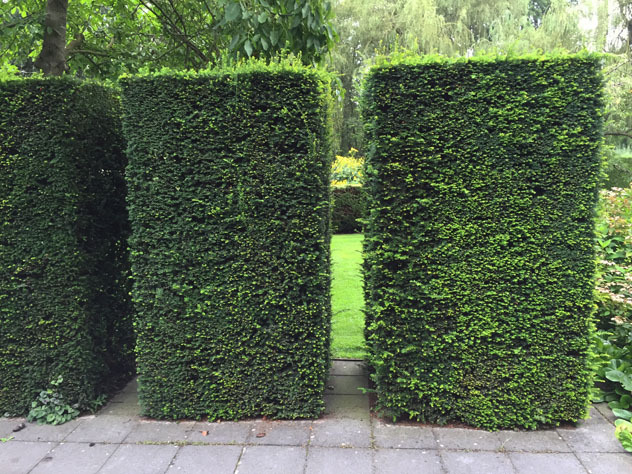 Ruys takes this idea and plays with it by planting a hedge as a backdrop, but leaving a small gap which allows the viewer to see beyond the garden room – a tease of what is to come. Her use of positive and negative space is implemented over and over in her designs. 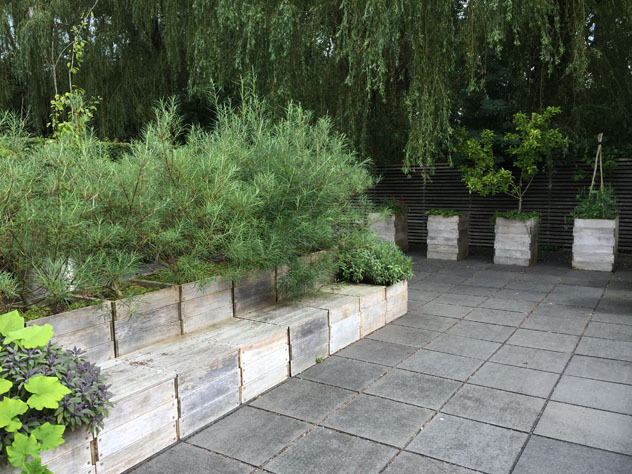 In one of her rooms she planted yews around a reflecting pool leaving gaps between the rectangular shapes; not only playing with negative and positive shapes, but also creating a dark and light pattern. 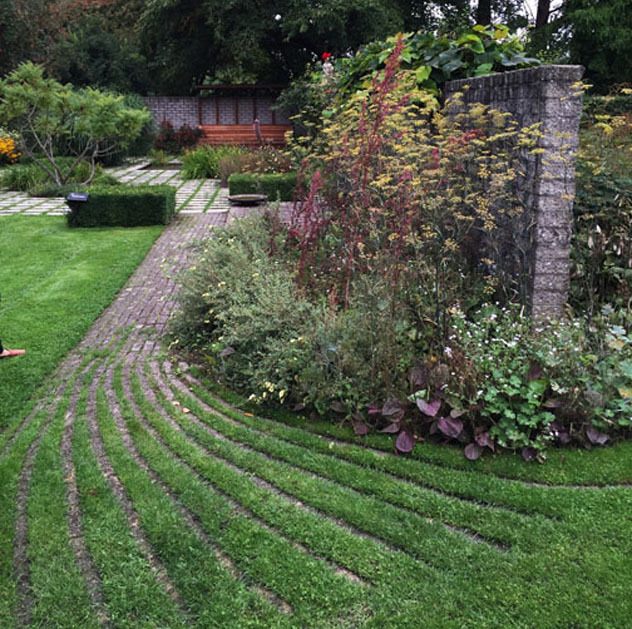 In another garden she laid a brick path along a border that eventually fades fanning out into the grass. 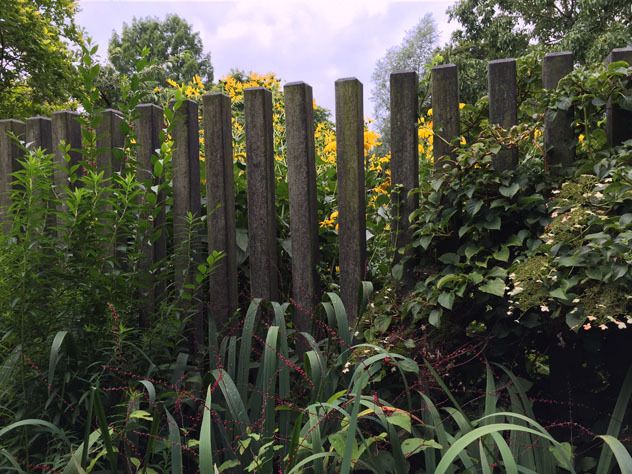 In the marsh garden called ‘Gardener’s Garden’ she used equidistant vertical concrete fence posts to create a modern sculptural fence. 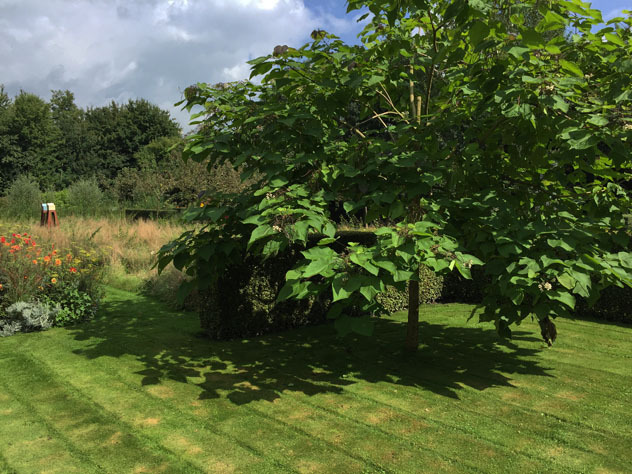 I loved seeing some pollarded willows repeated over a long stretch enclosing one of the garden rooms. By repeating patterns she knitted the gardens together. 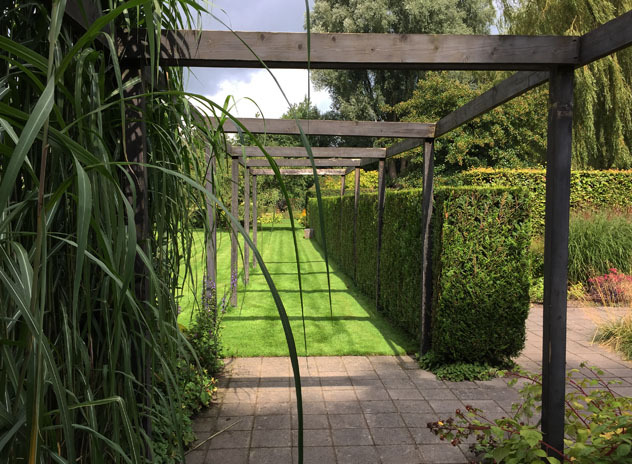 Her use of hedges throughout her design, works to achieve strong lines in her compositions, separating and defining the different garden spaces, and on a practical level, help block the near constant winds! 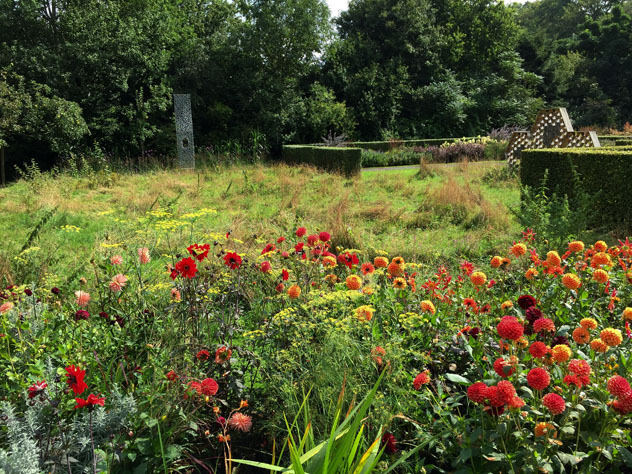 The perennials flowers and shrub foliage planted in front break the lines of the hedge and adds texture against the flat plane of the green hedge, not unlike a Hans Hoffman painting, modern and classical. The perfect balance between architecture and painting. 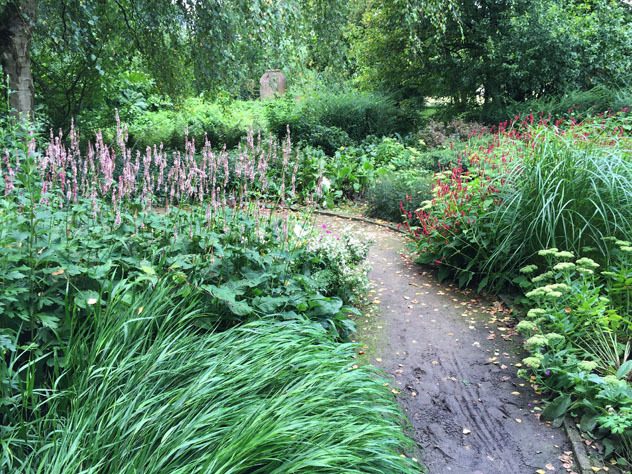 The gardens are meticulously cared for and what started out as an experiment has become a cultural legacy. 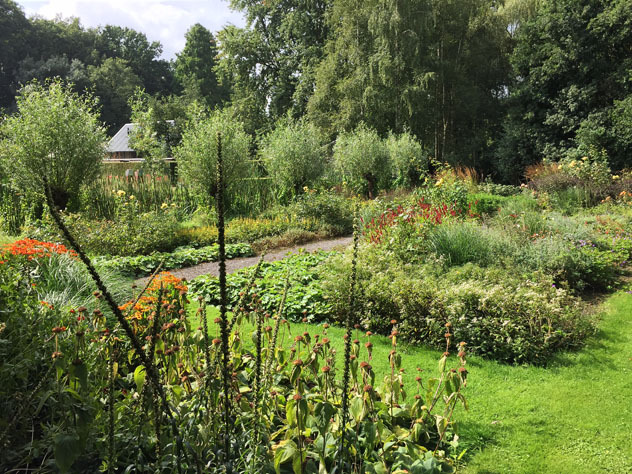 Along with the Mien Ruys Garden management and several Dutch organizations they have preserved the gardens, but also allow for new experimentation within the garden complex. 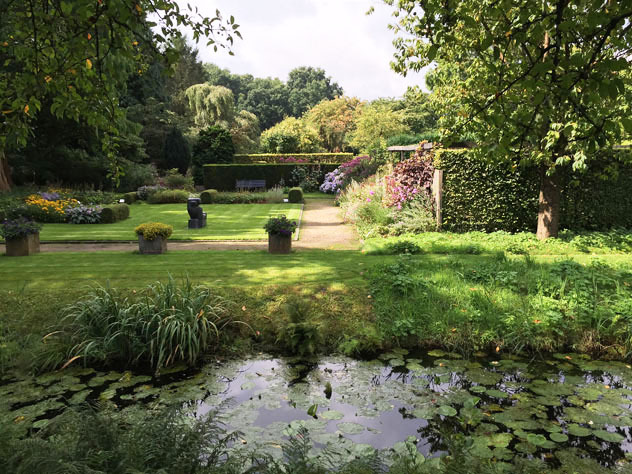 *Over the next month I will be posting many more of the Dutch gardens we saw. 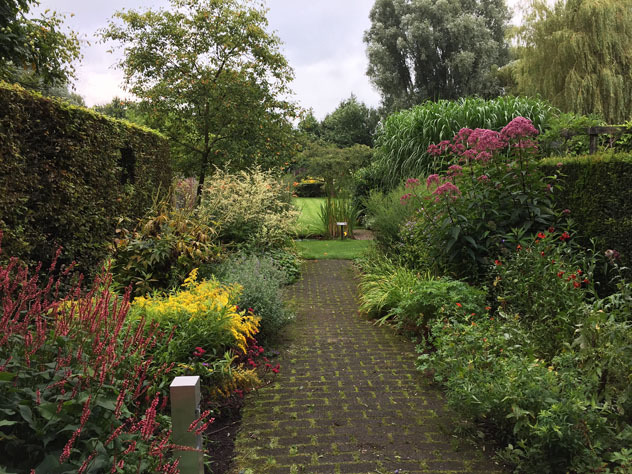 Gallery | This entry was posted in The Gardens Of Mien Ruys and tagged Garden rooms, Mien Ruys Gardens, Moerhein. Bookmark the permalink. This looks awesome, Don! Our modest vegetable garden got hammered by the weather down the shore this year… hope you are well. Hi Ross – sorry to hear about your garden. 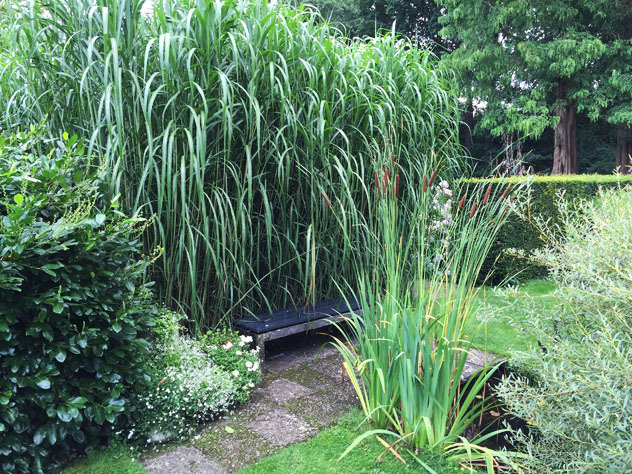 I returned from Holland and the garden was suffering from drought and looked completely wild & over grown! Thanks for the tour. I can see there is a lot of inspiration for your own garden here, and I’m sure there was much more you didn’t show. Funny you should say that Kathy about there being more I didn’t show. I took over a 1000 photos while in Holland and I am trying to pare them down. 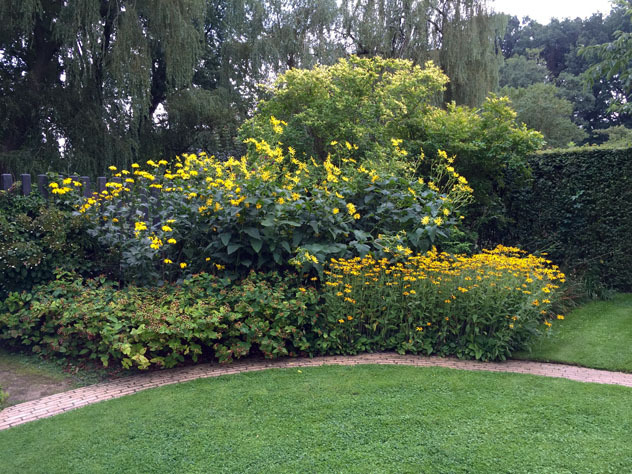 I really enjoyed reading this post, Don, and look forward to more about Dutch gardens. Pat I hope to see some posts from your recent garden tour of England & Scotland. Parrying down the photos — that’s always the challenge! 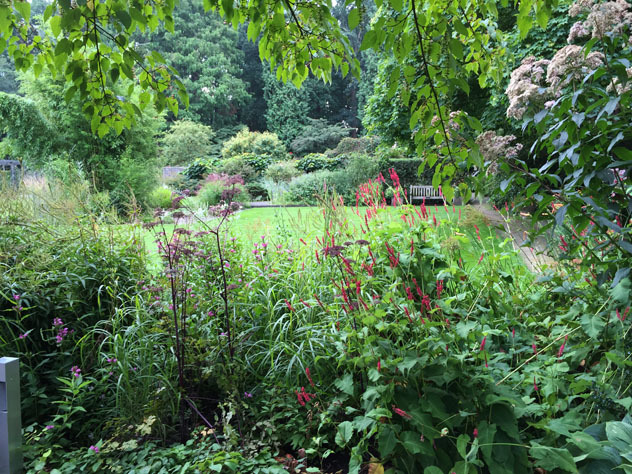 Lots of posts to write about the gardens I’ve visited this year — perfect for winter months. Superb! This is mind blowing even viewed from photographs. Love it. Great article but could you please make it Heyning instead of Henning? Thanks Nicholas. So sorry. I was struggling putting up all these photos and missed the type error.